200amp, main breaker, 40-circuit, Siemens indoor/outdoor residential electrical distribution panel. 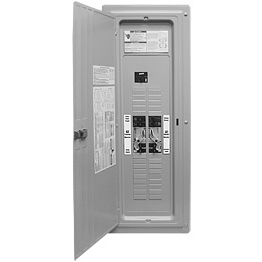 Built in automatic Generac 125amp transfer switch, compatible with generators rated up to 125amps/30kw. Generator can provide back up power to 18 circuits (bottom half of panel). Branch circuit breakers not included. Dimensions same as a standard 42-circuit main load center. Great for electrical service upgrades or new construction.